For today’s machine tool environment and heavy-duty applications, Titan offers hinged steel belt conveyors with several options for specific requirements. We offer five pre-engineered live powered roller conveyors. These chain conveyors work best for heavy product with a smooth bottom like sheets and pallets. Titan Conveyors introduces the Motorized Roller Conveyor, a modular conveyor system utilizing a 24 volt DC motorized drive within a roller. Titan's straight and curved BDLR conveyors will solve your package handling problems. Titan custom steel belt chain conveyors are ideal for light and heavy duty applications, including machine tool and chip-handling environments. Learn more. Three pre-engineered slider bed conveyors available to meet your material handling needs. Rubber belting is available on all models. Our bulk material handling conveyors are designed to handle large volumes of bulk materials for any size. Use roller bed conveyors when loads are heavier or much longer than a standard slider bed can handle. We offer two roller conveyor types. We offer two wire mesh belt conveyor models with a variety of configurations and three different bed materials: UHWM plastic, roller, or wear strip slider. 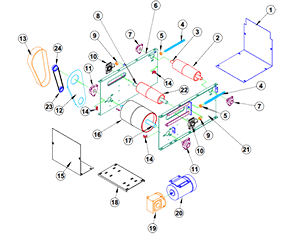 Titan's Cooling & Drying Conveyor increases efficiency in die casting: eliminating mist during cooling, and replacing water quench to reduce cool down time. When your plant layout requires a directional change in the smallest possible space, you should consider using a Titan Powered Turntable. Maximize floor space, change elevation efficiently. Model 204 is designed for light loads and short distances; Model 208 handles heavier, wider products. 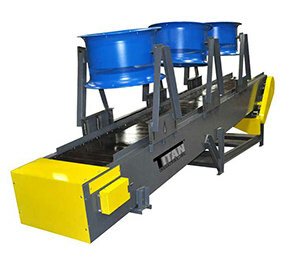 Titan Industries produces five different gravity roller conveyor models to choose from ranging in capacity of 95 pounds to 3,000 pounds per roller. Customizable cleated belt conveyors and parts conveyors handle various parts up an incline with different walls, cleat heights, and spacing to suit your needs. Titan Industries excels in creative solutions for our customers unique problems with cost effective, reliable, innovative. and customizable solutions. Find the right replacement parts for your hinged steel belts. We sell replacement belts that will even fit competitions. Choose the item you need today. Find the right replacement parts for your conveyor system. Choose the part you need, fill out the easy form. Our custom designed conveyors cut time and help efficiently get products to your customers. Browse our list of typical applications to learn more.